Xiangqi was supposed to be originated from Chinese as military strategies by which time there had been official documents about the game. 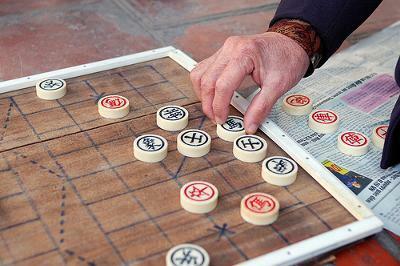 Earlier Xiangqi was composed of chess pieces, dice and board. Each player had six pieces before starting a game as the two players would play dice and the board was a square chess board. In the modern form of Xiangqi there’s no dice and the game is different from its ancient counterpart in terms of pieces and board which had 32 pieces in red and black, with one person taking 16 red pieces and the other taking 16 black pieces. The board is 9 lines wide by 10 lines long. The two players conduct a representational military battle with horses and chariots and organizing troops based on their understanding of the layout the game and the playing rules. The early version of Bao Yin Xiangqi, was different from the modern Xiangqi where the general carries a sword, Guards were females, wearing armor. The ministers are literally elephants, Rooks are wagons for transporting rocks and Knights are horses. Cannons are actually rock-slinging machines. Pawns are depicted to hold spears. This set was unearthed in Kai Feng in Beijing. The documentation of Xiangqi was generally attributed to Niu ZengYu who was the Prime Minister of Tang Dynasty. Whether Niu named the game after Elephant which rhymes with the word Minister or it's just a coincidence is still remaining as an unknown fact.